Mesut Ozil got a 2nd half hat-trick as Arsenal ran riot over Bulgarian champions, PFC Ludogorets. It was his first ever professional hat-trick and all came within 30 minutes. He joins Theirry Henry, Lord Nicklas Bendtner, Danny Welbeck and Olivier Giroud as Gunners with Champions League hat-tricks. It was match-day 3 of the 2016/17 UEFA Champions League group stage. Ludog0rets put up a good fight in the first half but were pegged back by a beautiful Alexis Sanchez goal in the 13th minute – a lovely extended chip. Ospina was called to action with about three saves before Theo Walcott rounded the half with a wonderful goal – outside the box. The second half began with the Ox on fire, springing on to a loose ball in the box to make it 3-0 to the Arsenal. Gibbs cross was not taken care of and the Ox smiled with a goal. Ozil latched unto a wonderful pass from Santi Cazorla to slot home Arsenal’s 4th and his 1st for the night. The fans had the luxury of watching Lucas Perez for 30 minutes as he came on for Theo Walcott. El Neny also replaced Santi Cazorla who was seen wrapped up on the bench. Injured? Iwobi also came in for Alexis Sanchez. Lucas Perez was put through on the left and his cross was sent in by Mesut Ozil for his 2nd and Arsenal’s 5th. 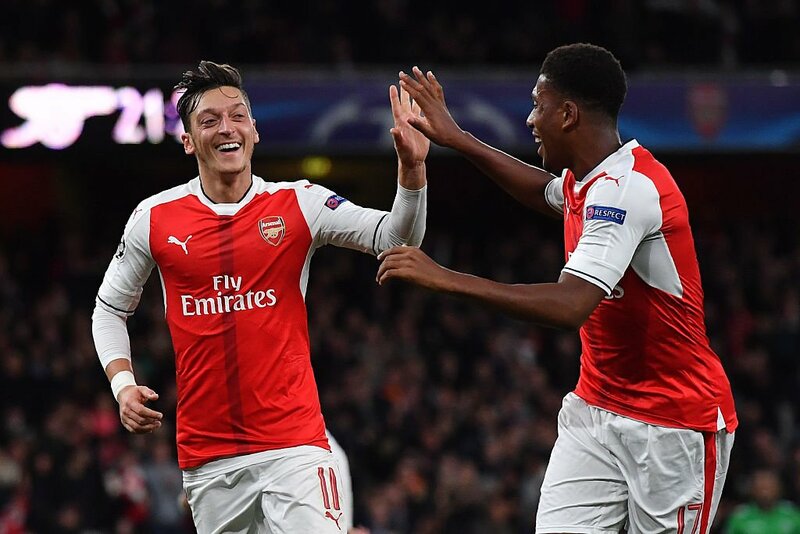 The duo combined again, from the right this time, to give Arsenal a 6-0 victory at the Emirates. The pace of Lucas Perez must be acknowledged. It is great to see him involved in the last too goals. The Gunners could have added more misery to the Bulgarians but 6-0 was enough. Ozil got his ball, Koscielny and Mustafi got a clean sheet and the Gunners are top of the group – thanks to a higher goal difference. PSG were 3-0 winners over Basel. They travel to Bulgaria next in the Champions League. In other Champions League matches, Messi scored thrice as Barcelona defeated Pep’s Manchester City 4-0. It was a game of red cards and defensive errors. Lesson to Pep? Leicester City have 3 wins in 3, Celtic lost at home, Napoli were stunned 2-3 by Besiktas in Naples, Real Madrid had it easy over Legia Warsaw. Other results can be found at the UEFA official website. Time to enjoy the 6-0 win.